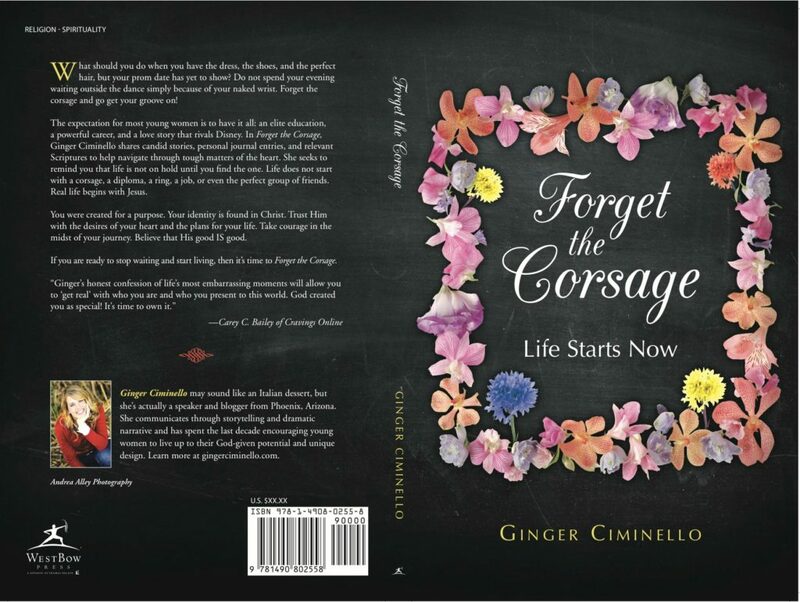 In September of 2013, Ginger released her first book, Forget the Corsage. What should you do when you have the dress, the shoes, and the perfect hair, but your prom date has yet to show? Do not spend your evening waiting outside the dance simply because of your naked wrist. Forget the corsage and go get your groove on! The expectation for most young women is to have it all: an elite education, a powerful career, and a love story that rivals Disney. In Forget the Corsage, Ginger Ciminello shares candid stories, personal journal entries, and relevant Scriptures to help navigate through tough matters of the heart. She seeks to remind you that life is not on hold until you find the one. Life does not start with a corsage, a diploma, a ring, a job, or even the perfect group of friends. Real life begins with Jesus. You were created for a purpose. Your identity is found in Christ. Trust Him with the desires of your heart and the plans for your life. Take courage in the midst of your journey. Believe that His good IS good. If you are ready to stop waiting and start living, then it’s time to Forget the Corsage. 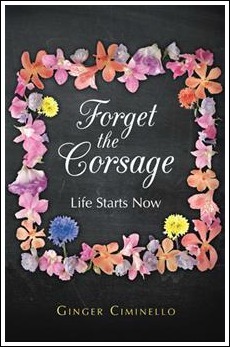 Forget the Corsage is available at Amazon, Barnes & Noble, and Westbow Press. Ginger is authentic and full of passion to see every girl walking in their true identity in Christ and all the fullness God has for them. She did a great job of incorporating her humor, the truth of God’s word and personal stories into a wonderful and interactive book. Girls of all ages will be able to relate to her struggles, questions and experiences. I look forward to using her book as a resource when mentoring high school girls and would definitely recommend it to all my friends! I think this is the most practical and wisdom-filled read on purity and dating that I’ve read in a while (if ever). For me, it easily lined out what scripture says about the purity of our hearts and bodies as well as went above and beyond the “don’t do it!” It answered lots of questions that I know my girls struggle with and encouraged them to think about their own hearts and how they are currently treating their hearts. I wish I had read this book when I was in high school, or even junior high! Just the same, it has proven to be useful for a young lady, such as myself, in college. Forget the Corsage is one of those books you’ll always have somewhere nearby, no matter what season of life you find yourself in. Each page is filled with so much truth that it’s hard not to refer back to it every once in a while. Ginger starts each chapter with a topic girls my age often worry about. She digs into her own past (and lets us go with her on numerous occasions) to provide a real-life situation that instantly makes things more personal and therefore easier to apply to our lives. Attacking the problem head-on, she breaks it down into its most basic parts and provides undeniably clear explanations for anything we might find confusing, all the while filling the book to the brim with an abundance of sound Scripture. Beautifully written and extremely impactful, this book should be in the hands of girls everywhere. In her debut nonfiction work, Ciminello offers wisdom for teenage girls and young women based on Christian spirituality. Without holding back, the author describes how, like many young Christian woman, she struggled to accept God’s will when it didn’t mesh with her own desires or expectations. Each chapter describes a stumbling block Ciminello confronted during her formative years, and these stumbling blocks are similar to those faced by many teen girls, especially those pursuing Christian lives. For instance, she describes how she spent the majority of her senior prom waiting for her date to arrive with her corsage. The date—a friend she went with since her crush asked another girl—arrived late and without the corsage, and Ciminello missed out on having fun that evening because she refused to act against her expectations. Alongside each embarrassing and honest story, the author provides a spiritual lesson through Scripture and faith-based reflection. She connects her prom experience to the way that one might wait for life to “begin” even though all one needs has already been gifted by God. Each chapter closes with a journal entry from Ciminello’s past and space for the reader to write a journal entry of her own, rounding the lesson off in a personal manner. This book is best described as personal. By using stories from her own life, the author gains the authority of experience while maintaining a friendly, conversational voice. As such, she can make firm statements about right and wrong and the importance of following God without seeming haughty. Her tone is reminiscent of one a gentle older sister might use in guiding her younger counterpart, making the lessons she offers easy to accept. Additionally, Ciminello crafts her book with a clean structure, making it even easier for readers to follow. Aside from maintaining a similar, sensible form, each chapter is long enough to provide real food for thought without dragging on and causing attentions to drift, further improving the work’s readability. A reflective, persuasive look at spiritual development for young Christian women, told by someone who’s been there.